Okay, okay, I have jumped on the crazy pumpkin bandwagon at last. I was doing just fine resisting all the pumpkin muffin, pumpkin, cookie, pumpkin cheesecake, pumpkin coffee, pumpkin coffee cake, pumpkin ice cream, pumpkin smoothie recipes. Because, you know, I’m still hanging on to summer. It helps a little that fall hasn’t arrived in NC, at least not in any meaningful way. Fall here is like a teenage girl texting–here one second, completely distracted and bumping into people the next. Summer seems to focus on us like a laser beam, so I’m sticking with it until fall decides to pay attention. 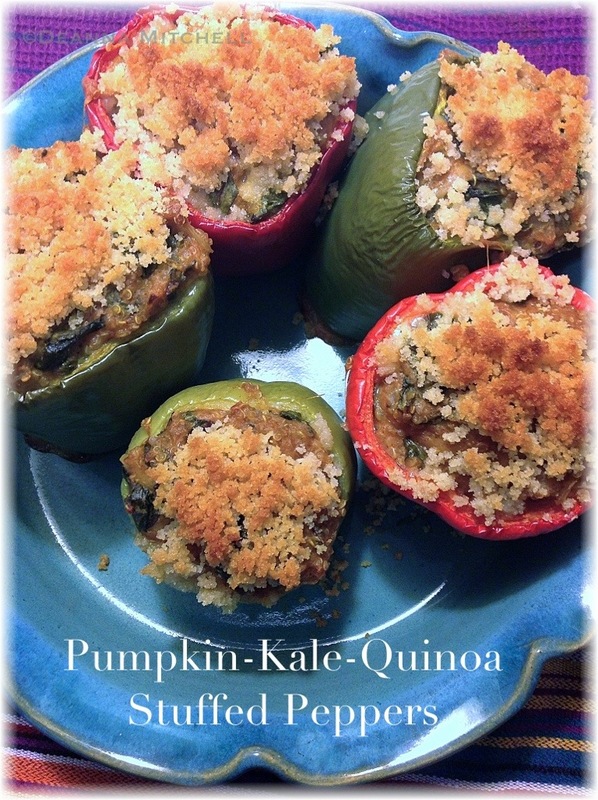 I did decide to acknowledge fall this weekend, however, when I saw this recipe from Amy at What Jew Wanna Eat. It is easy, delicious, and made the most of foods that are available right now, like fresh bell peppers from our garden, organic kale, sweet onions and locally made organic cheddar cheese. The only substitutions I made from her recipe were to use kale instead of spinach and plain almond milk instead of milk–both worked great! I added the chopped kale raw and it cooked just fine. Next time, I may try this with sweet potato instead of pumpkin since we are typically up to our ears in them by November! This recipe is flavorful, nourishing, and absolutely delicious. Measurements and cooking times are spot on. All the thing you want in a healthy, fall (or late summer) supper. Click HERE to get the full recipe! Thanks for sharing my recipe! Your photo is beautiful! 🙂 Mind if I share it on my Facebook page? I’ll make sure to link to your page! Thanks for sharing my recipe and I’m glad it was a hit! Do you mind if I share your photo on my Facebook page? It’s beautiful! I’ll link to your page on it. Seriously, I could eat the filling straight out of the pot! Thanks for sharing the photo!